It is looking like a great weekend for kite fishing, particularly Saturday. The east coast is the place to be. For those in the north Pakiri, Uretiti and Mangawhai are popular beaches for the wind we are anticipating. On Saturday the forecast is for strong southwesterlies over the whole country. Later in the day the wind should go more to the west and moderate. The strong southwesterly winds continue for the South Island on Sunday. For those fishing north of Taranaki winds are expected to be light west to northwest winds. For the rest of the North Island the winds will be light southwesterlies. Porongahau should be excellent for both days. We have found our 9 foot tall kite fisherman/ photographer. It was Steve Johstone of Orewa. The photo above and in our last newsletter is of Barbara Johnstone at 90 Mile Beach. Steve has emailed us with the details. The photo in newsletter 30 is of Barbara, my wife, and our dinner for a few nights. 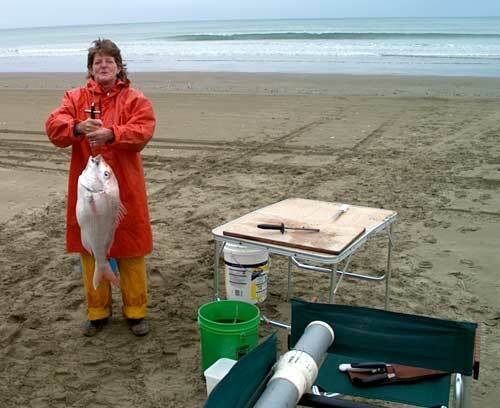 The catch was taken from 90 Mile Beach, about 8kms north of the Waipapakauri ramp. By the way, I am not 9 foot tall, Barbara was kneeling next to the fish at the time I took the photo. We were using kahawai for bait and set the gear around 1200 metres out. Powering the Bottom Longline Rig was a Nighthawk Kite and Large Skyhook. I only use Target Snapper Hooks when longlining from the beach or the boat. I have used these hooks since their release, mixed with standard hooks, I now use 100% Target Hooks. The success of these hooks speaks for itself. I have included another pic of Barbara looking very pleased with herself after landing a nice snapper on 90 Mile Beach. Also attached is a pic of our winch setup used to pull the gear back in. The winch has variable speed and has an auto system for laying the line on the spool. Say hi to Paul and Peggy from us. Thanks for the excellent site and regular info. Your efforts are very much appreciated. Steve and Barbara's winch used to haul in their Bottom Longline Rig. Not too much to report due to the weather conditions, there is a 3 to 4 m swell and very little wind to speak of. The sea is flat with a 30 knot westerly, ideal for kite fishing, but it's Wednesday and most people are at work. Had one report phoned in this morning from Wayne Moxham from Levin. Wayne said he came across from Levin to try out our beach, as he has been reading Paul's weekly newsletter on the net. Wayne took his 4 wheel drive vehicle on to the beach and set his kite off in front of the Country Club. He had trouble getting his gear our on the first set due to a lack of wind so he changed to the Power Chute Kite. This worked well as he managed to put out one set and caught a few kahawai. Unfortunately he had to leave after one set to get home in time to milk the cows. Wayne asked me if there is any short cut to Porangahau from the west coast as it took him 2.25 hours to get here from Levin. If anyone is coming from the west coast go through Dannevirke to the Takapau works, turn right and go past the works. Drive over the railway line, turn left, drive approx three kilometres down this road until you come to a single lane bridge. Around 200m past the bridge is a fork in the road, turn right at the forks and follow the road through to Porangahau Road. Turn right there and carry on out to Porangahau and onto Porangahau Beach. I have had very good feedback from the article about Porangahau in the September issue of the "NZ Fishing News." We set a Dropper Rig with seven hooks 2 1/2 hours on an incoming tide. Having fished Waihi previously we are very aware of the paddle crabs in the area so we tied the bait to the hooks. After 40mins we retreived the gear and all baits came back untouched. We rebaited (tied the bait to the hooks) and sent it out again to 1000 metres. We caught one gurnard. We decided to send out the submarine two hours before high tide with 13 hooks (note it was black Friday)and left it fishing for 1 1/2 hours before retrieving. We caught five medium to large gurnard. High tide was at 12-15pm and the weather was cloudy, with some sunny spells and the odd shower. The sea was slight. Goldie and I have purchased an onsite caravan with the intentions of fishing Whiritoa, Papamoa, Matata and perhaps Pukehina. We purchased the submarine because we live in Hamilton and many times we have gone fishing and alas, the wind has changed. We have trouble flying the kite in any sort of northerly wind on the east coast beaches. I shall send in a report when we return home from our fishing excursions, from where ever we fish . We are really enjoying the kitefishing newsletters. While I was visiting Doubtless Bay at the end of last month I decided to do some kite fishing. Using my Big Dropper Rig I set 19 hooks out twice. I was using squid for bait. There was a light southwesterly wind, the sea was slight and the tide was going out. The gear set straight out from the beach. Absolutely nothing caught, but there you go! What a great place and a lovely spring afternoon. David Billings took my wagon to Uretiti Beach last Sunday. He returned with three good snapper. These fish were in prime condition and all weighed over 1kg. The best of them weighed 1.7kg. David set his Bottom Longline out to 1000 metres and baited up with mullet. 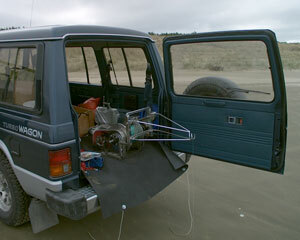 The gear was set near the top of the tide with very little wind to power the Kite. He still managed to get the Kite up and deliver some fish! David gave me a snapper for dinner which was very tasty. When cleaning the fish I found three round white rings in its guts which I can only describe as scallops. I have put these with my bait to use next time out. Second time lucky maybe? I couldn't get a shot of the fish as I had no camera on Sunday. I am interested in making contact with other kite fishermen in Taranaki with the purpose of arranging a gathering of enthusiasts to share tips, techniques, fishing localities etc, and maybe form a branch of the Kitefishing Club if there is an interest in doing so. Please feel free to contact me. We have some very interesting news about the snapper tagging programme on the west coast coming in the next newsletter. Keep an eye out for this information as we are sure all kite fishers will want to be part of the project. If you find any plastic beads in your snapper's gut cavity, hang onto them, they are intelligent tags. See next week's newsletter for details.